1. High-speed impact crushing and eddy friction grinding of mine can improve crushing efficiency and crushing ratio and save energy consumption. 2. Less dust in production engineering and improved working environment. The strict internal air flow self-circulation system is adopted, and there is almost no dust leakage, so there is no need to set up dust filter device, thus meeting the requirements of environmental protection. In addition, on the premise of increasing the energy input, using the pressure airflow in the crusher, the crusher can also be equipped with a grading cyclone for grading, which improves the quality of the broken products to meet the needs of the relevant industries. 3. With selective crushing function. Cubic crystal is the most useful stone for construction industry, but it is not an easy job to make. 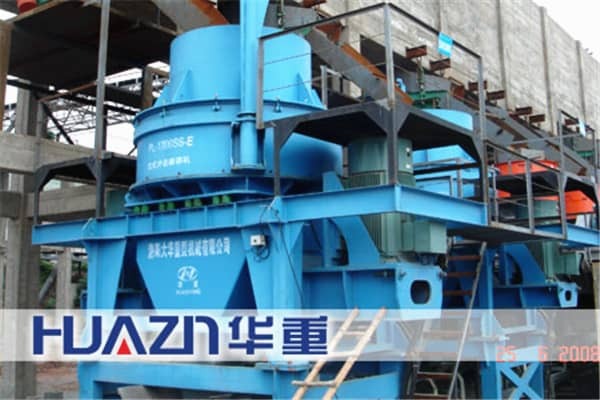 Vertical impact crusher can break the broken ore along the fragile grain interface by using "stone to stone" self-impact, and the finished product has a good grain shape, so it can get cubic crystal material. Especially for special hard, medium hard, corrosive materials more advantages. High speed impact and friction crushing of materials in the vortex crushing chamber can produce extremely fine materials with coarse grinding effect. 5. Small wear and tear, low vibration and noise. There are replaceable wear-resistant plates embedded at the exit of the launching channel in the pre-dust stage of the rotor, and the crushing process occurs between materials in the launching channel and in the vortex crushing chamber, so there is no wear on the crusher. Therefore, the small wear of the metal parts solves the wear problem between the lining plate and the broken medium, which greatly reduces the cost of wear. 6. Simple structure, flexible use, high manufacturing cost, flexible use, convenient maintenance. 7. Convenient access door, convenient maintenance. 8. Wide application scope and wide practicability. According to actual needs, single motor and double motor can be used for driving, and the feeding hopper mode can be single or double feeding mode.